Please refer to our stock # 771 when inquiring. 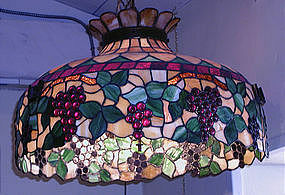 This leaded fixture is well done with beautiful coloring. Bunches of grapes hang in red and purple, along with green leaves admist a carmel background. It has a 24" diameter and is approximately 14" deep.